Curtis Stone arrives at the Us Weekly Hot Hollywood Style Celebration on Thursday April 22, 2010, in Los Angeles. 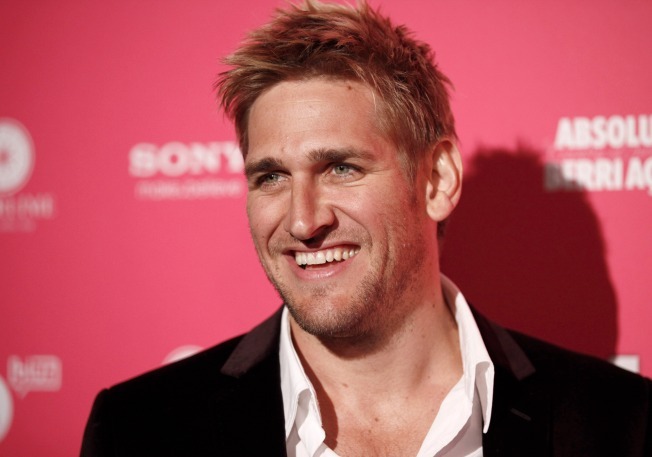 Break out that pint of comfort-flavored ice cream you’ve been stashing away and curl up on the couch, ladies, because Curtis Stone — the hot young Aussie-born chef, TODAY show Man Panelist, and star of the star of the upcoming NBC reality show “America’s Next Great Restaurant” — has confirmed he has a girlfriend: actress Lindsay Price. Granted, the two have been quietly dating for a year — but on Friday, Stone officially revealed the relationship on TODAY. “We got set up; it was a mutual friend who said that we should hang out, so we gave it a shot. My first blind date,” Stone told TODAY’s Hoda Kotb during the show’s fourth hour Friday. The 35-year-old chef was substituting for Kathie Lee Gifford as co-host. Stone declined to go into details of that first date with the former “Lipstick Jungle” star, but he was willing to share a few embarrassing details about another one. “It was the first time we were in New York together, and she said, ‘I want you to meet a couple of my friends,’ ” he recalled. Among the friends Price referred to was her “Lipstick Jungle” costar Brooke Shields. To impress such company, Stone chose to entertain the party at a high-end restaurant and “ordered a really nice bottle of wine and this big extravagant dinner,” he told Kotb. Stone, an avid surfer from Melbourne, Australia, was an Australian Rules football player before he became a culinary star in the U.S. when he starred in "Surfing the Menu" in 2003. In 2006, People magazine dubbed him one of its Sexiest Men Alive. Price, 34, has been linked romantically in the past with her "Lipstick Jungle" costar Robert Buckley and with actor Josh Radnor, with whom she guest-starred on the series "How I Met Your Mother." With the demands of their busy schedules, the couple can expect to spend a lot of time apart. But in a brief exchange with a TODAY viewer during a segment of “3, 2, 1 Live with Sara Haines” later in the fourth hour, Stone said he’s learned a few lessons on how to keep the burners lit in a long-distance relationship. “None of my long-term relationships have ever worked out, so do what I didn’t do, and that is stay in touch every day,” Stone advised. “Make sure you speak in the morning and the evening.